Are we the second oldest choral society in the UK? (Congratulations to Halifax, 1817, for being the oldest). The Society began in the first part of the nineteenth century following the opening of the Subscription Rooms in October 1834. Delightful snippets of everyday life in the nineteenth and twentieth centuries together with the trials, tribulations and successes of the Choral Society, come to us from the pages of the local newspapers. Early concerts in the Subscription Rooms were regarded as tremendous social occasions of great importance. However, there was one occasion in 1845 when the Choral Society, singing at Cirencester, was paid £40 to go away! Concert goers in the 1860’s were incensed by the state of Street lighting in Stroud. Going home after concerts, they complained that the gas lights where either too close together or more infrequent than angel’s visits. The renovations of the Sub Rooms in 1869 caused further anguish to the Stroud populace. The renovations were taking far too long and costing too much! By a curious twist of fate, Mendelssohn’s ‘St Paul’ was the last concert given before the closure in 1869 and the first choral concert given in the opening week following the recent renovations in 2000. Readers will enjoy the one-man campaign in 1868 by someone using the pen-name Ex-Impresario. Over a period of many weeks he urged The Journal readers to take notice of his ideas in order to raise the standard of choral music in Stroud to international levels. Maybe professional musicians may know, or be able to guess at, the identity of Ex-Impresario. Getting carried away on 1904, The Stroud Journal declared, in bold letters and quite erroneously, that ‘The Choral Society had died of ambition’ as it was impossible for a small town such as Stroud to continue putting on concerts that involved an outlay of £100 each. 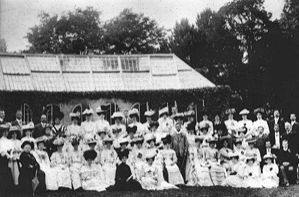 The open-air concert in Stratford Park, Thursday 18th July 1907 Far from having died of ambition, the Choral Society rose to many challenges of the twentieth century. Though one problem, that of singing with their backs to the audience in the Parish Church, took many years to solve! During WW2, the Society ‘did its bit’ by staging concerts on Sunday afternoons to avoid blackout difficulties. These concerts were immensely popular, with queues stretching from the Parish Church down the length of the High Street waiting to get in. Under Sammy Underwood, their conductor for over 50 years, the society went from strength to strength. Composers used the society to showcase new works. Famous soloists such as Isobel Baillie, Janet Baker, Heddle Nash and April Cantelo came to sing. Amanda Roocroft, of international acclaim, gave her first professional performance with the Society in 1986. The Society has supported charities throughout both centuries, singing as early as 1851 to raise money for the Casualty Hospital and supporting the new Stroud Hospital from 1873 onwards. During the latter part of the twentieth century, the Society has supported the Hospice movement, in particular, Cotswold Care. Although the Society has uncovered much of its history there still remains some secrets and mysteries to be explained. Perhaps a future reader may be able to throw light on some of those unsolved questions.